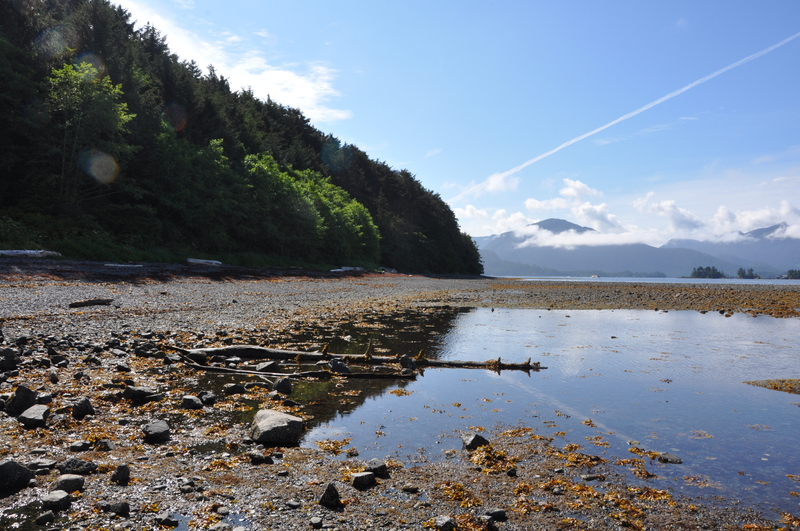 Executive Summary: The National Park Service (NPS) and Western Carolina University’s (WCU) Program for the Study of Developed Shorelines (PSDS), have developed a Coastal Hazards and Sea-Level Rise Asset Vulnerability Assessment Protocol. This protocol assesses the vulnerability of infrastructure to multiple coastal hazards and climate change factors over a 35-year planning horizon (to the year 2050). The overall goal is to standardize the methodologies and data used, allowing managers to compare the vulnerability of coastal assets across local, regional, and national levels. This protocol is also designed to accommodate regional differences in coastal hazards (e.g., storm surge vs. tsunami), geomorphology, evolving data sets, and scientific understanding of hazards. Unlike natural resource vulnerability, which combines three metrics (exposure, sensitivity, and adaptive capacity), the protocol assesses infrastructure using exposure and sensitivity to coastal hazards and sea-level rise to derive a vulnerability score, with adaptation strategies discussed qualitatively in the context of that score. 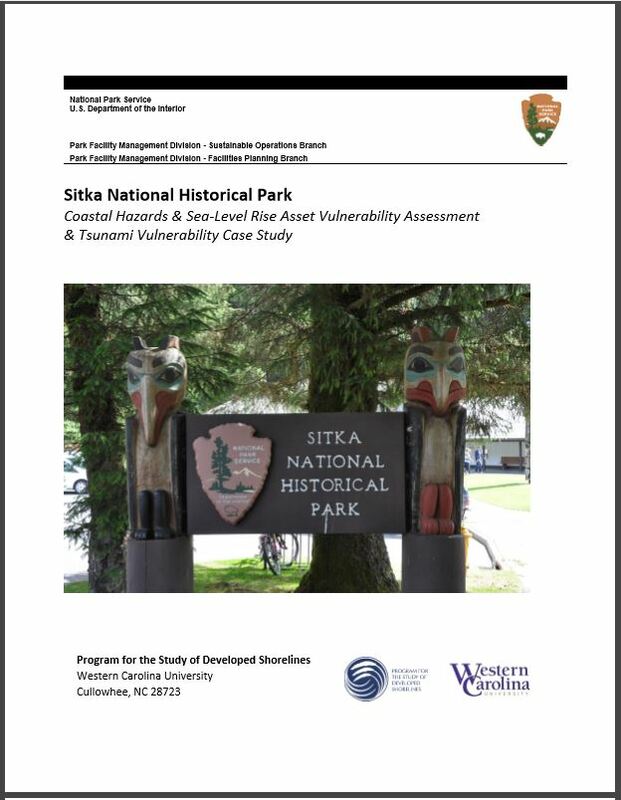 A total of 33 structures and 10 transportation assets were included in the vulnerability assessment of Sitka National Historical Park (SITK). Similar to other parks, the vulnerability to multiple coastal hazards and climate change factors (i.e., erosion, flooding, tsunami, sea-level rise, and historical flooding) was assessed. However, because the tsunami hazard poses such a significant threat at SITK, a separate case study was completed focusing specifically on tsunami vulnerability for structures and transportation assets. Scoring and methods were identical to the complete vulnerability assessment protocol, except that only tsunami hazards were evaluated. Coastal Hazards and Sea-Level Rise Protocol: Over one-quarter of assets (28%) at SITK have high vulnerability to the five coastal hazards evaluated, while only 9% have moderate vulnerability. The majority of assets at SITK have either low (49%) or minimal vulnerability (14%). Eight totem poles are the only structural assets with high vulnerability, and all four high vulnerability transportation assets at SITK are trails. 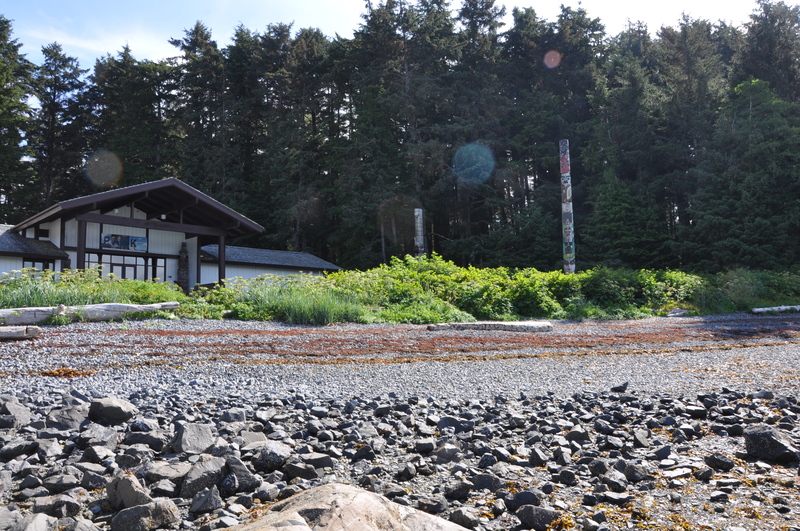 One of these high vulnerability trails, the Totem Walk, is high priority to the park (asset priority index from NPS facilities database), as it provides access to the totem poles that are central to the park mission. Four structures have moderate vulnerability, including the Visitor Center, which is the second most valuable asset (current replacement value > $9 million within the NPS asset management database), while the highest value building in the park, the Russian Bishop’s House (current replacement value > $10 million), has low vulnerability. Tsunami Vulnerability Case Study: The results of the case study show that 65% of SITK assets have high tsunami vulnerability, 21% have moderate tsunami vulnerability, and 14% have minimal tsunami vulnerability. The assets located on highest ground have minimal tsunami vulnerability. The combined current replacement value of the high tsunami vulnerability assets is over $26 million, which is roughly 84% of total asset value at SITK. Assets with moderate tsunami vulnerability have a combined value of $2.9 million (9% of total), while assets with minimal tsunami vulnerability have a combined value of $2.2 million (7% of total). This tsunami vulnerability (and the potential for widespread devastation) is significant at SITK, and is deserving of further study.